The tactic seems to be working. Facebook signed up for the company’s Enterprise Geocoding Module, which assists the social networking giant’s location capabilities, and Pitney Bowes today enjoys successful partnerships with Google, Experian, and Axciom. We caught up with Pitney Bowes Group Marketing Officer David Newberry via email and phone for an in-depth look at the company’s evolution and, more generally, his thoughts on digital marketing and its future. With last month’s announcement of a new CEO at Pitney Bowes, in what direction will the company’s digital marketing move? In general, marketing as a function needs to up its game and help senior management understand the contribution that marketing can make to an organization’s future commercial success. The impact of corporate transparency, social media, and online communities / networks is giving rise to a highly informed and intelligent buyer. The same trends in B2C are now evident in B2B with the rise of the social buyer who’s radically different from the traditional B2B buyer. These buyers rely on the Internet and communities for their information, expect sales to be active in the same conversations / communities, and want sales engagement at all stages of the buyer’s journey. This places more importance on marketing to support and guide sales because winning requires sales and marketing to operate as one function. What three key trends in digital and integrated marketing do you see in the year ahead? Marketing will become more complex due to more sources of data, more channel fragmentation, and continued growth in customers’ expectation and the vendor landscape (both agencies and tech companies) that continues to blossom. Investing in analytics to build understanding. Understanding what you set out to achieve allows you to focus. Introducing technology to streamline complexity — but use it as an enabler, not as a means of solving a challenge. You must already have a strategy in place for technology to truly deliver value. Take a TCO (total cost of ownership) approach to marketing and focus on outcomes as this is the only way you can justify the role of marketing. What challenges do marketers face in truly achieving integrated marketing? Where are the opportunities? How to organize the marketing team and to allocate responsibilities. The complexity of marketing is such that you need specialists. One person can’t be expert in everything. This requires a clear strategy on what should be undertaken internally and what can or should be outsourced. Cross-functional collaboration is also a key imperative both in terms on building the right internal culture by working with HR and internal communications but also in integrating external touch points across service, support, and sales. A marketer has to be both a leader (aligning an entire organization to key initiatives) as well as a manager (empowering team members to experiment and raise their game). The CMO has a tough task. People love real insight from peers. What did you learn in 2012 that you can share with us? Marketing needs to take an agile approach to the way it operates. Having set roles and defined goals at the start of the year no longer works. Small project teams that are provided full accountability for outcomes and then can identify and define how they’ll deliver is the key to success. Focus is also key. There’s significant noise in the market and to break through, it’s essential to be as relevant to the target audience as possible. To achieve this, you need to have a very well-defined audience and to truly understand what interests them, what their expectations are, and what will resonate. The audience needs to feel that it’s being treated as individuals. Try, fail, and try again. It’s only by trying new things that you can be disruptive and create interest. Marketing team members need to be empowered to break away from the old traditions. You need to break the status quo, move people around, change their roles, put small project teams in place, and create a collaborative culture. We often talk about data and measurement being the glue that makes integrated marketing possible. What’s your approach to data and measurement? First, define your market. You need to set the boundaries for the market you seek to address. In other words, define the field of play. You then need to be able to segment that market based on customer needs and then create a segmentation framework that forms the foundation for all future analysis (i.e., needs-based segmentation). This may well be adapted and change as you learn, but it’s imperative to have well-defined segments in place as this enables a marketer to identify and define an ideal prospect and, through that, identify the audience to be engaged. The third area is then to be able to measure your performance across various segments. Marketing needs to take an outcome-focused approach rather than report on the performance of specific activities that are really only a proxy for identifying the real value created from marketing investments. Marketing should also be accountable for helping an organization keep an eye on long-term success factors rather than just quarterly revenue and EBIT numbers. What’s been overhyped in digital marketing circles? The term Big Data. It’s Little Data that’s important. The ability to identify what specific data and data sets can help you build understanding and establish the opportunity to influence customer behavior. It’s sorting the wheat from the trough and working out which data is important and making sure you’re able to capture and apply the insights that comes from that. Too much talk of content that’s not connected to experience. A message or creative (content) can no longer be developed in isolation of its application. You can no longer develop your content and then apply it to various channels because that misses the importance of the experience that needs to be created. Marketers and agencies now need to develop their content in the context of the experience they’re trying to create and to think about channel, customer context, time of day, preferences, etc. as they do this. This requires corporate brand marketing and digital marketing to work very closely together. Silo teams no longer cut it. The concerns of a B2B business obviously diverge from a B2C. Which hurdles are Pitney-Bowes most focused on? There are a couple of trends that are interesting and show a convergence between a B2B company and a B2C company. The first is the current nature of corporate transparency and the fact that your customers can find so much more information about you. This means that marketing must care and take interest in all touch points with the customer. Many of these will also be employee-based, and hence an organization’s culture will dramatically influence how a brand is perceived by an external audience. Creative advertising is no longer enough. B2B companies are now catching up on the importance of corporate brand marketing and its connection with company culture. The second interesting trend is that in both B2B and B2C the focus is moving to marketing to a segment of one, the utopian goal of marketing. In both cases, the role of marketing is to treat each potential buyer as an individual. The key thing about segmentation is you don’t market to a segment. You market to an individual, but you always need to understand the role of the individual within that segment. Is that segment growing? Is it shrinking? Are you taking the right solution to that segment? Are you successfully winning in that market segment? Those are the broader strategic questions. Digital marketers are always interested in the next new thing in digital. Is there a little-known tool, startup, or technology that’s captured your fancy lately? There is growing importance in SoLoMo and its application to help marketers better engage with their customers. Within this, I can identify three companies with interesting technologies. One (whoops) is Pitney Bowes, which has some great location technology. Two other companies would be FunMobility, a company that has technologies to help firms use mobile for relationship / loyalty marketing. The other is EngageSciences, which enables companies to apply and amplify positive earned media as part of an integrated digital campaign. In both cases, great technology and wonderful people. New ecommerce stats highlight the growing importance of reserve and collect services, with 40% of UK consumers using such services over Christmas. Econsultancy’s Christmas 2012 Online Shopping Survey, produced using Toluna’s online survey tool, polled 1,000 UK and 1,000 US online consumers on their shopping habits. It looks at attitudes to online delivery, use of mobiles and tablets for shopping, and the role of the web in the research and purchase process. It was conducted online, so we can assume that respondents are reasonably tech-savvy. What do you love or hate about email marketing? Tell us! For the past six years, Econsultancy and Adestra have been asking marketers on both the client and agency side for their opinion on what is happening within email marketing. This year we are doing the same again, launching our seventh survey to take the pulse of email marketing and to see what those at the coalface are doing to get the best results of their efforts. 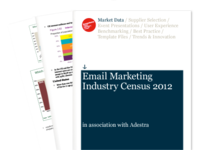 Those taking part in the Email Marketing Industry Census will get a free copy of the report, worth £250/$400.